Turdus migratorius est migratoria familiae Turdidarum avis canora, in America Septentrionali endemica. Coloribus, praecipue rubro maris pectore, videtur Erithaci rubeculae similis; ergo nomen Anglicum American robin, quamquam hae species non sunt cognatae, quod Erithacus rubecula est membrum familiae Muscicapidae. Turdus migratorius est avis civitatis Connecticutae, Michiganiae, et Visconsiniae. Haec avis in dollario $2 Canadiensi seriei "Aves Canadae" anni 1986 depicta est. Turdus habetur signum veris. Exemplum clarum est poema Aemiliae Dickinson, "I Dreaded That First Robin So." Inter alios poemata saeculi undevicensimi de primo veris Turdo est "The First Robin" Doctoris Gulielmi H. Drummond. 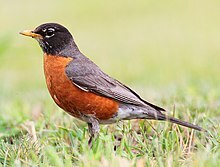 Popularia carmina Americana de hac avi sunt "When the Red, Red Robin (Comes Bob, Bob, Bobbin' Along)," a Harrio M. Woods compositum et "Rockin' Robin," a Rogerio Thomas compositum. ↑ 50 States. "50 States"
↑ Canadian Paper Money Society. "Canadian Paper Money"
↑ Bank of Canada. "1986 Birds of Canada Series"
↑ "Sheet music for "When the Red, Red Robin Comes Bob, Bob, Bobbing Along" - Ruth Etting". The Ruth Etting Web Site. 1997–2007 shows the cover of early sheet music.